Just to give you a quick update, since December that I changed my strategy a bit, but the biggest change was the broker. Using a Portuguese bank for my porfolio was expensive in terms of transaction comissions and was kind of hard to activated the conventions to avoid double taxation of dividends. TLT is the only one that pays dividends, but there's no other ETF that has US-government treasuries with those maturities. I probably should have done some more rebalancing on TLT. Maybe I'll do that later, when I put some money I've saved this year onto ETF. I've read some interesting arguments favoring actively managed ETFs when it comes to bond markets, which is more exotic than stock markets. I realized I don't have much exposure to bond markets outside US. Something along the lines of a PIMCO Global Bond ETF is something that crossed my mind. adding more money (how is this called in English?). I see you have quite a bit in interest rate sensitive securities. My interest rate allocation is below 10% at this point and it is mainly in my emergency fund. Have you looked at an ETN called SVXY. This is a play against the volatility index and it has a strong upward bias due to the fact that it trades futures that expire. I liken it to one of the few securities that accurately tracks inflation. It is very volatile but, as i said, the long term trend is up and will stay up. If we do have a panic this will tank but it will snap back pretty quick and any drop would be a great buying opp. I'll just suggest you put it in your 'securities to research' pile. I am very pleased with the results from it. 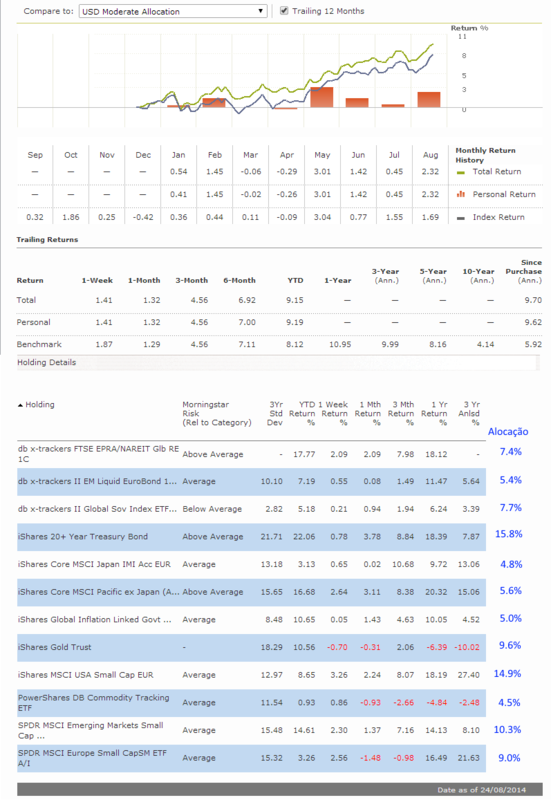 Since most of the (financial) internet is targeted for US investors, it's somewhat a pain to get a good (free) site to create a portfolio using european ETFs. Most of the time they don't exist, quotes are as accurate as a bling man throwing darts, and charting functions are bad or non-existant. Financial times is good for quotes, and now I found out the Portfolio manager of Morningstar. It has good quotes, and while the charts are not very flexible, it does allow you to compare the portofolio to a certain number of benchmarks. Below is the performance of my portfolio (the version with capitalizing dividends) ever since I started it in December. Written by Paint are the allocation %. So what do you think of the S&P500 hitting 2K Rui? Are we at the peak or is there room to grow?